Fertilizer provides lawns, gardens and crops with the necessary nutrients required for adequate plant growth. Unfortunately, misusing fertilizers can cause plant diseases to trigger and cause serious damage. Following the manufacturer's directions when applying fertilizer is the first step in avoiding fungal infections in your garden. Two common diseases that are encouraged by the overuse of fertilizer are melting out and leaf spot, which are caused by the drechslera poae fungus and sorokiniana fungus, respectively. Symptoms of infection are reddish-purple or purplish-brown blemishes that appear on the grass. As the infection spreads the lawn will begin to thin out and die as large patches of fungi form, varying from a few inches to several feet in size. Leptosphaeria korrae fungus is known to cause necrotic ring spot infection in Kentucky bluegrass. The black fibers of the fungus will cover the tops and roots of infected plants as the disease develops. 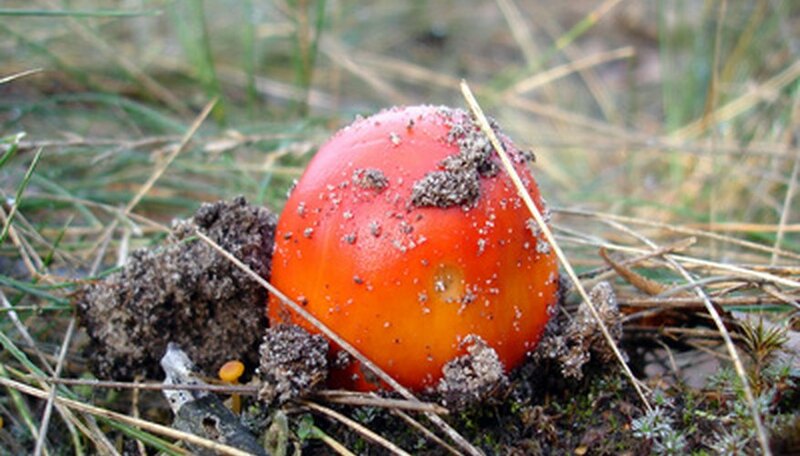 Through the addition of fertilizer, the fungus will spread, creating patches of straw, dead and even unaffected grass to turn red as a sign of the nearby disease. The spots can spread to anywhere from 6 to 24 inches around. Another disease brought on by the excess use of nitrogen fertilizer, pythium blight is caused by pythium spp. This fungus appears as tan spots on the grass ranging in size from 1 to 6 inches. The disease quickly spreads when the grass is mowed while blades are wet. Another symptom is an oil that is released on the plant during early morning. Hollow heart disease is a common fungus that is known for attacking potato crops when fertilizer is overloaded. The disease shows itself by turning the center of the potato into a star-shaped hole. Brown center is another disease that often precedes hollow heart, making the modified stems more susceptible to attack by other diseases, turning them brown and ruining future harvests. Infected plants are not dangerous to human consumers, but the quality and taste of the potato is affected. Balancing pH levels, moisture and avoiding excess fertilization are the first steps farmers and gardeners can take to reduce the progress of fungal diseases. Fertilizing crops should be done by splitting the process into several steps instead of fertilizing all crops at the same time. This promotes uniform soil moisture and helps prevent the spread of any present diseases in the soil. Jonathan Budzinski started his writing career in 2007. His work appears on websites such as WordGigs. Budzinski specializes in nonprofit topics as he spent two years working with Basic Rights Oregon and WomanSpace. He has received recognition as a Shining Star Talent Scholar in English while studying English at the University of Oregon. Why Is My Lawn Turning Yellow?